At the crossroads where the sanctified traditions of fine craftsmanship encounter the bold novelty of contemporary art and where the creative talent of the artist forges with the watchmaker's dexterity to craft a unique masterpiece, a matchless work of art is magically born: "Artpiece 1/1", an exceptional timepiece, part of the first Artya collection of 360 unique pieces 1/1. 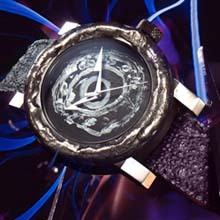 "Coup de foudre", a second collection featuring watchcases litterally struck by lightning. 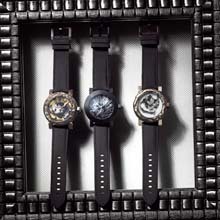 Artya's supreme mission is to fundamentally change the watchmaking syntax through the grammar of contemporary art. The workshop's initial assignment, the Artpiece 1/1 collection, heralded a new era, pioneering the appreciation of beauty, thereby relegating the context of time to the back seat. Emotion, creativity and intuition fuel the whole concept. This avant-garde venture sets a new direction away from the current trend in watchmaking which perceives contemporary art as a device for advertising campaigns or an easy solution to enhance the aesthetics of some dials. Here, the boot is firmly on the other foot: According to Yvan Arpa: "Imagination running wild leads the artist, and the watchmaker has no choice but to follow". Initiated by art, this approach is based upon the know-how and expertise of craftsmen and watchmakers, collected over centuries. The Artya workshop has introduced unprecedented processes in watchmaking, implementing techniques harvested from the field of art. Deeply immersed in the contemporary art scene, Yvan Arpa, with his unequalled experience of watchmaking, gained at Sector No Limit, Baume & Mercier, Hublot and Romain Jerome, conceptualized the idea to blend art into a timepiece, to transform this everyday ustensil into a piece of art, through creating a composition to be worn on the wrist, half-way between a painting and a sculpture.To fulfil this endeavour, he called upon a painter that he knows well and has been close to for two decades, Dominique Arpa-Cirkpa, his spouse. He entrusted her with the dials of the Artpiece 1/1 collection. Alarmed at first by the constraints of size and materials, she quickly imposed her own creative vision and artistic touch by exploring different media and means such as various colours, paste, bristles, brushes, and knives, to create incomparable works of art. These dials embody aspects of miniaturized paintings. As a boundless expression of the intricate precision that commands watchmaking, they turn into true works of art reigning supreme on the wrist of the aesthete, the enthusiast or the collector. Each piece in the "Artpiece 1/1" collection is unique. Created by the artist, crafted by the watchmaker, these one-of-kind artistic creations are each distinctly made, none can be doubled or replaced. Difference, not conformity, is their hallmark. Obeying the artist's whim and imagination, the watchcase from the "Coup de foudre" collection are struck by lightning and undergoes thermal combustion, moulding, engraving and various drastic processes that are handcrafted in the Artya workshops. Artya presents the "Artpiece 1/1" and the "Coup de foudre" collections at the opening of the Geneva Time Exhibition from 17th to 22nd January 2010. Not to be missed, and created especially for this event: the "Coup de foudre" movie featuring Arc Attack's live performance in which the first watch of the collection is literally struck down by the artists. As a vibrant tribute to the Gilbert & George spirit, Artya conceives a contemporary work of art, a true allegory for the creative process that has inspired and guided this maverick collection. Each dial is a unique work of art. Hand decorated according to 17 specific artistic techniques up to now unexploited in the watchmaking field. They combine collage, application of dyes and pigments, forging, etc. The hand-sewn strap is made of high-tech rubber combined with processed “Alzavel waterproof” calfskin or with “Crazy frog” tanned toad skin. Geneva Time Exhibition from 17th to 22nd January 2010. Not to be missed, and created especially for this event: the “Coup de foudre” movie featuring Arc Attack’s live performance in which the first watch of the collection is literally struck down by the artists.